Acupuncture is a treatment with very thin, hair-like needles based on Oriental medical theory. In our body, there are rivers of energy called Meridians (Keiraku). Acupuncture regulates the energy (Ki) in these pathways to boost up our natural self-healing power. The diagnosis consists of listening to your health issues in detail, checking your pulse in your wrists, checking your abdomen to see where you feel tender or tight and checking diseased area such as knee if your health issue is knee pain. ​Round-Tip Needles: are thick and has a round tip so it won't penetrate the skin, and just touches the skin to harmonize the energy flow directly or indirectly, leading to loosening up the tension and the tenderness. Moxa is dried herb (mugwort) used for heat therapy. When it is applied, you may feel warm or pinchy a little bit. This is often used for gynecological problems or digestive problems. 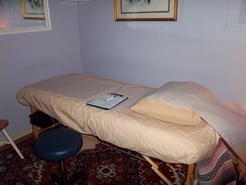 In Cozy Acupuncture, there are 2 kinds of treatments applied within 1 treatment. ​One is to harmonize the energy flow of the whole body. Another is to treat the diseased area or symptoms. The treatment to harmonize the energy flow of the whole body is called Root Treatment. Harmonizing the energy flow of the whole body makes the pulse slower, the abdomen and muscles softer. That means the autonomic nervous system calms down and the immune system is strengthened, leading to stress reduction and prevention of diseases. Another part of the treatment which tries to improve the symptom you are straggling with is called Local Treatment. For example, if you have knee pain, the diseased knee is treated directly or indirectly to improve the knee pain. There are usually painful or tender spots around the knee when pressed with fingers. I try to relieve the painful spots using the acupuncture points on the same energy pathway. A lot of painful spots when pressed before the treatment instantly disappear after the treatment and you should be able to move your knee without pain or you feel less painful compared to before the treatment. When your health issue is chronic, even if you feel better right after the treatments, the symptom can come back so the accumulation of the treatments is necessary to make the period without the symptom longer or not to make the symptom reappear. Also to improve even between treatments, I usually give some home therapy advice such as exercise, dietary advice or self-treatment using coins. ​Please check various cases of acupuncture treatment actually performed in Cozy Acupuncture by clicking here.